Muslims are taught that prophets are humans who have been selected by God for a special purpose. They are given miracles to assist them in their message but these miracles are not performed through their own power, but through the power of God. The prophets of God have no divine powers of their own, nor even the power to decide who will go to heaven or to hell. They are merely there to convey the message entrusted to them by God to the best of their ability. In a similar manner, Muhammad (pbuh) was assisted by God with a number of miracles and entrusted to convey His message to mankind. Muhammad (pbuh) himself, however, was just a regular human being. He could not issue passes to heaven. He could not condemn people to hell. He could not change what was in people's hearts. He could only convey the message and hope that they would believe. Muhammad (pbuh) lived like any other man or woman of his people. He dressed like they dressed. He ate the same food they ate. He lived in the same manner and in the same sort of houses they did. It would be impossible for someone who did not know him to pick him out of a crowd. Muhammad (pbuh) taught his followers through example. If he commanded his followers to do something, he would be the first to abide by this command. He never broke his word, he was by far the most charitable man among his people. He was the most God-fearing and the least attached to this life. He never in his life accepted charity, but worked for a living. He never lied. It was not at all uncommon for him to spend months on end enduring severe hunger never seeing a single cooked meal. He taught his followers to be merciful to their children and respectful to their elders. He commanded them to never taste alcohol, gamble, engage in usury (interest), fornication, envy, deceit, or back-biting. 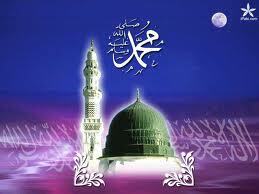 Muhammad (pbuh) taught that no human being needs any other human being to intercede for him with God. He showed them that God is within the reach of all his creation. He hears and sees all and answers His servant's prayers. Muhammad (pbuh) further severely cautioned against promoting any of God's creation or groups thereof to higher levels of divine authority and closeness to God than others, or the excessive glorification of any human being. This includes the prophets of God themselves. He taught that the very best of God's servants are those who continuously seek out knowledge and that God sees all that they do. Muhammad (pbuh) taught his followers to be industrious and to earn an honest living. He taught them that the best Muslims are those who are not overly obsessed with earthly wealth since excessive wealth usually leads to corruption. However, he also taught that a wealthy person who is not blinded by his wealth is not condemned by God and may even be able to utilize his wealth in acts of worship not available to the poor. In other words, Muhammad (pbuh) taught moderation in all things. "Righteousness is good conduct, and sin is that which weaves inside your chest and you hate for it to be revealed to mankind."